Note: this is an expanded version of an article which appeared in The Boston Globe. If you think listing your home in the spring is your best bet to get top dollar for your home — think again! The best time to list your home and obtain the most money is actually in the winter, typically in February. Why? Simply because buyers get the urgency to buy homes faster than sellers get the urgency to list them. We see it every year: large numbers of buyers start to look at homes in late January, then by mid- February they are eager to buy and inventory of homes is still very low. Good old supply and demand comes into play. Since there tends to be more buyers than sellers in the winter months, homes start selling fast, with some homes even selling over asking price. Last winter when it was colder and we had more snow than normal, there were still many buyers out looking. The problem was, most sellers were not listing their homes. So inventory dropped to an 11-year low which caused many multiple offer situations and effectively raised prices. With fewer homes on the market in the winter months there is less competition for your home and more attention from buyers. According to an article from the Washington Post, houses put on the market in winter had a greater probability of selling within 180 days and at a smaller discount to the initial list price than houses put on the market during the spring months. The article also said that the harsh weather last year didn’t prevent buyers from searching, they were ready to purchase early in the year. The problem was the weather prevented sellers from listing their homes because they didn’t want to take the time to prepare their homes for winter showings. They waited until later in the season. You may be thinking, but spring is the busiest season in real estate, isn’t it? It’s true that in the spring thousands of homes sell and home prices peak. But what most people don’t realize is that many of the contracts were signed in the winter. Remember most real estate transactions take an average of 6-8 weeks to close. In the spring many deals get delayed even longer as some sellers want to wait until after the school year ends. The vast majority of homes that close in May and June—when home prices peak (as reflected in the graph below)—are from deals that came together in February and March. 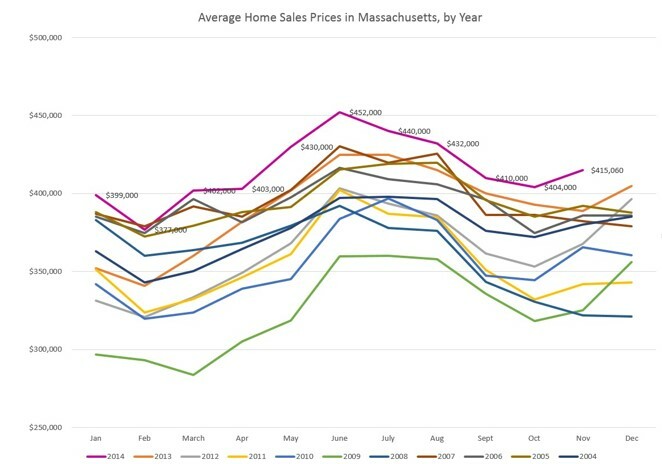 As an example, we looked at total home sales in Massachusetts in May 2014. According to data from MLS Property Information Network, Inc., homes listed in February sold for an average price of $467,998, 14 percent more than $411,286, the average price of homes listed in April. The same was true for home sales in 2013 and 2012. Homes listed in April that sold in May sell for less than homes listed earlier in the year. 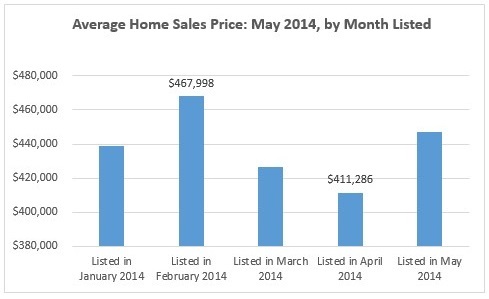 We can see the same pattern when we look at home sales in June 2012, 2013, and 2014 as well. For all three years, homes listed in the winter months sold for higher average prices than those listed in April. Low inventory earlier this year caused prices to go up, especially in the condo market. So if you’re thinking about waiting until spring to sell your home, you should reconsider and put your home on the market in the winter when there’s less competition.